If you are learning how to make apple squares, they might be in the form of a delicious dessert; one that will need to be served on a dessert plate. It could be too thick and moist to eat by hand. You might want it served a little warm like apple pie or apple crisp topped with a scoop of ice cream or a dollop of whipped cream. Recipes like these are great to serve to guest along with fresh coffee or tea. This is also a nice dessert to finish a good meal. As you learn how to make apple squares, they could also be more like the bar cookie recipes, apple bread or even coffee cake one that can be eaten by hand like one would eat cookies. These must be drier and firmer so that they do not fall apart when eating and become too messy. When you learn how to make recipes for apple squares you will find these are wonderful anytime of the day. They make a great snack, many are delicious breakfast bars or like the more moist ones can be served with coffee or tea to guests. Now that we are in the beautiful fall season and the peak of apple season (my favorite time of the year) this is the perfect time to make some of these delicious recipes for apple squares. Added ingredients besides apples and the amount of these ingredients are what determine the type of apple squares which the recipe will produce. Common ingredients which the recipe will include will be flour, sugar, shortening, milk and eggs. I love apple squares which are seasoned with spices like nutmeg, cinnamon, ginger, cloves and allspice; they just enhance the flavor of the apples. Of course I love my two favorite ingredients sour cream or cream cheese in the recipes; they simply improve the texture. Also a great ingredient which you will find in many recipes is rolled oats; this is especially true for ones suitable for breakfast. Some other great ingredients you might find in recipes for apple squares or you might want to add to your recipes are all types of chopped nuts and raisins. These two ingredients add texture and flavor and combine very well with apples. Also try adding chopped candied fruit like red and green cherries; great for the holidays not only for taste but to add color. Chocolate chips and coconut really add a lot of taste to an apple recipe. Some recipes might instruct you to bake apple squares recipe in a nine inch square pan but most will tell you to use a 9 X 13 inch baking pan. 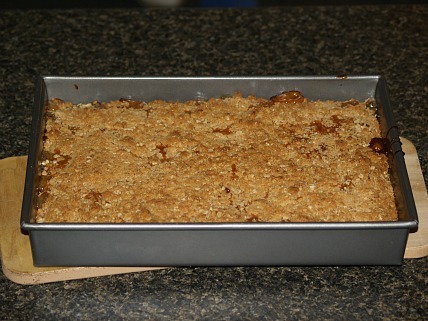 To make a thinner recipe of apple squares you might want to bake them in a half sheet pan. I would never multiply the batter and try to bake in a larger pan than a half sheet size. The squares usually bake too much around the edges and not enough in the center of the pan. The storage of the squares will depend largely on the individual recipe. Many will need to be stored in the refrigerator. The dryer “cookie like” recipes will be all right kept at room temperature. Keep this is mind after they cool to room temperature; if uncertain store in refrigerator. Combine the flour, brown sugar and butter in a large bowl and beat on low speed until crumbly. Stir nuts into flour mixture. Press 2 ¾ cups of the crumb mixture into an ungreased 9 x 13 inch baking pan. Combine and blend the cinnamon, soda, salt, sour cream, vanilla and egg. Add cinnamon mixture to the remaining crumb mixture and blend well. Stir in the chopped apples and spoon mixture over the crumb mixture in the pan. Bake for 30 to 40 minutes; cool and cut in squares. Combine and mix sugar and butter; stir in 1 ¾ cups flour, oats salt and baking soda. Remove 2 cups of mixture and reserve for topping; press remaining in 9 X 13 inch baking pan. Toss apples with 3 tablespoons flour; spread over mixture in pan. Heat caramels over low heat and stir until melted: spoon evenly over the apples. 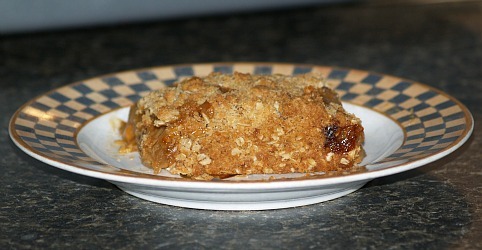 Top with reserved crumb mixture; bake for 25 to 30 minutes or until apples are tender. Cut into squares to serve; refrigerate remaining squares. This almond squares recipe is full of apples giving a great taste and texture. Combine 1 cup flour and sugar; cut in butter until crumbly. Press on bottom of 9 inch squares baking pan; bake for 20 minutes or until light brown. Beat eggs until thick and lemon colored; stir in brown sugar, vanilla, apples and almonds. Sift together remaining ingredients; stir into egg mixture. Spread over the baked crust; bake for 35 minutes. Combine brown sugar, cornstarch and 1 cup water in large saucepan; add apples and stir in. Bring to a boil stirring constantly; reduce heat and simmer 5 minutes while stirring. Remove from heat; stir in cinnamon, nutmeg and 1 tablespoon lemon juice and set aside. Combine flour and salt; cut in shortening until mixture is crumbly. Combine egg yolks, water and 1 tablespoon lemon juice. Sprinkle evenly over flour shortening mixture; stir with fork until dry ingredients are moistened. Divide dough in half; roll half to 15 X 11 inch rectangle on floured surface. Place rolled dough in bottom and up sides of 13 X 9 X 2 inch baking pan. Spoon apple mixture into dough lined pan; roll remaining dough into 13 X 9 inch rectangle. Transfer dough to top of apple filled pan; fold edges under and crimp to seal. Cut slits in top to let steam escape; bake at 400F degrees for 40 minutes and cool on rack. Combine powdered sugar, butter, milk and vanilla and beat until smooth. Drizzle glaze over warm pastry; cut in squares to serve.